Two new playable Allied Races are waiting in the wings to join the Battle for Azeroth as part of the Horde and Alliance—but first, you’ll need to prove your worth and earn your way into their good graces. The Zandalari are a proud people whose origins date back to the early days of Azeroth's history. Their fierce warriors ride dinosaurs into battle, and they possess one of the most formidable naval fleets in the known world. City of Gold: Discover more gold from creatures. Embrace the Loa: Beseech a loa, obtaining one of six powerful boons. Pterrordax Swoop: Summons a pterrodax to reduce your falling speed. Regeneratin’: Concentrate to heal yourself rapidly over a short time. Earn the achievement Zandalar Forever! 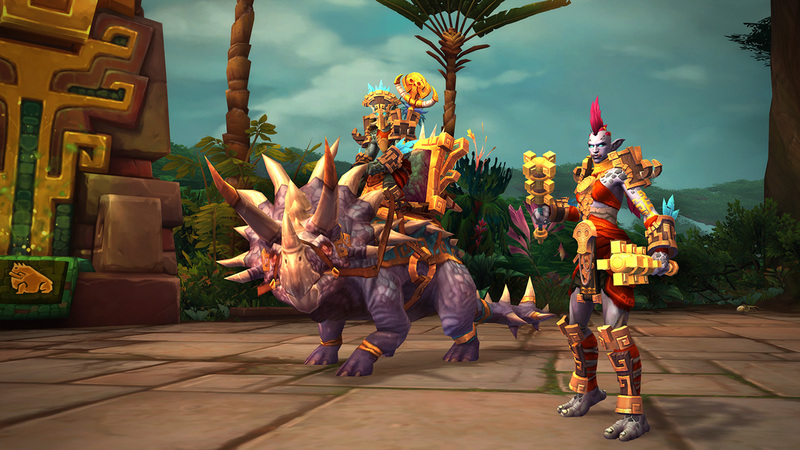 When the next content update goes live, players who’ve completed these requirements will gain access to a quest chain to recruit the Zandalari as an Allied Race. 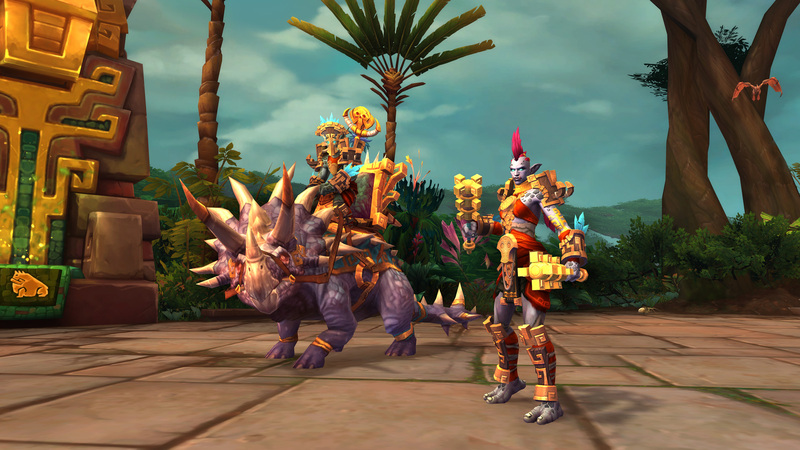 Once you complete the chain, you’ll receive the achievement Allied Races: Zandalari Troll and can create a new Zandalari on the character creation screen. Note that while the campaign continues into the Battle of Dazar’alor raid dungeon, completing that is not required to gain access to the new race. Leveling your new Zandalari troll from 20 to 110 will earn you a cosmetic Heritage Armor set that is unique to this new Allied Race. You’ll also unlock a new mount—the Zandalari Direhorn—for your collection at character creation, which all of your Horde characters can ride. Kul Tiras was founded by fearless explorers who sailed uncharted waters in search of adventure. As a key member of the Alliance of Lordaeron, the Kul Tiran navy dominated the seas of Azeroth with its legendary fleet. Brush It Off: Increases Versatility and heals a portion of the damage you take. Child of the Sea: Swim faster and breathe longer underwater. Haymaker: Smash your opponent, stunning and knocking them back. Jack of All Trades: Skill in all professions increased. Rime of the Ancient Mariner: Resistant to Frost and Nature damage. Complete the following achievements and quests on the continent of Kul Tiras: A Nation United, Loremaster of Kul Tiras, The Pride of Kul Tiras. When the next content update goes live, players who’ve completed the requirements will gain access to a quest chain to recruit the Kul Tirans as an Allied race. Once you complete the chain, you’ll receive the achievement Allied Races: Kul Tiran and can create a new Kul Tiran on the character creation screen. Leveling your new Kul Tiran human from 20 to 110 will earn a cosmetic Heritage Armor set that is unique to this new Allied Race. 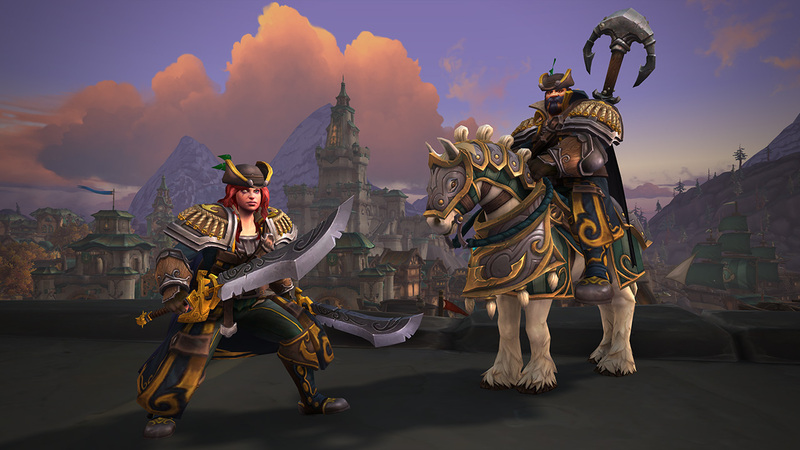 You’ll also unlock a new mount—the Kul Tiran Charger—for your collection at character creation, which all of your Alliance characters can ride. If you’re still working your way through the Horde and Alliance War Campaigns, don’t worry. We’ve put together a brief walkthrough of what you need to do to prepare to unlock the new Allied Races. At level 110 and after you’ve completed the opening quest lines of Battle for Azeroth, you’ll be introduced to the new War Campaign and begin the road to opening new Footholds over time in the opposite faction’s territories. Your first quest will be The War Campaign, which introduces you to War Resources. After the quest Mission From the Warchief, you’ll be introduced to the mission table, which will allow you to begin sending followers you gain through your adventures out to carry out missions. Access to Footholds will become available as you level through Zuldazar, Nazmir, and Vol’dun. At each key point in your journey (level 110, 114, and 118) you’ll be able to establish a new Foothold in Drustvar, Stormsong Valley, and Tiragarde Sound. At level 120, you’ll begin focusing more on reaching reputation milestones with The Honorbound. Complete the War Campaign in Zandalar and Kul Tiras. Chapter 1: The First Assault—Requires level 120 and Friendly reputation with The Honorbound to begin the associated War Campaign quests to earn this achievement. Chapter 2: The Marshal’s Grave—Requires at least 4,500 into Friendly reputation with The Honorbound to begin the associated War Campaign quests to earn this achievement. Chapter 3: Death of a Tidesage—Requires at least 3,000 into Honored reputation with The Honorbound to begin the associated War Campaign quests to earn this achievement. Chapter 4: At the Bottom of the Sea—Requires at least 7,500 into Honored reputation with The Honorbound to begin the associated War Campaign quests to earn this achievement. Chapter 5: The Strike on Boralus—Requires Revered reputation with The Honorbound to begin the associated War Campaign quests to earn this achievement. Complete the Horde Tides of Vengeance War Campaign. Chapter 6: The Day Is Won—Requires the completion of the Ready for War achievement to begin this quest line. Chapter 7: Mekkatorque’s Battle Plans—Requires the completion of the War Campaign chapter The Day is Won and at least 7,000 into Revered reputation with The Honorbound. Chapter 8: Through the Front Door—Requires the completion of the Mekkatorque’s Battle Plans chapter of the War Campaign and at least 14,000 into Revered reputation with The Honorbound. Chapter 9: Fly Out to Meet Them—Requires the completion of the Through the Front Door chapter of the War Campaign. Your first quest will be The War Campaign, which introduces you to War Resources. After the quest Mission From the King, you’ll be introduced to the mission table, which will allow you to begin sending followers you gain through your adventures out to carry out missions. Access to Footholds will become available as you level through Tiragarde Sound, Drustvar, and Stormsong Valley. At each key point in your journey (level 110, 114, and 118) you’ll be able to establish a new Foothold in Nazmir, Zuldazar, and Vol’dun. At level 120, you’ll begin focusing more on reaching reputation milestones with the 7th Legion. Chapter 1: Blood on the Sand—Requires level 120 and Friendly reputation with the 7th Legion to begin the associated War Campaign quests to earn this achievement. Chapter 2: Chasing Darkness—Requires at least 4,500 into Friendly reputation with the 7th Legion to begin the associated War Campaign quests to earn this achievement. Chapter 3: A Golden Opportunity—Requires at least 3,000 into Honored reputation with the 7th Legion to begin the associated War Campaign quests to earn this achievement. Chapter 4: Blood in the Water—Requires at least 7,500 into Honored reputation with the 7th Legion to begin the associated War Campaign quests to earn this achievement. Chapter 5: The Strike on Zuldazar—Requires Revered reputation with the 7th Legion to begin the associated War Campaign quests to earn this achievement. Complete the Alliance Tides of Vengeance War Campaign. Chapter 6: War Marches On—Requires the completion of the Ready for War achievement to begin this quest line. Chapter 7: The Sleeper Agent—Requires the completion of the War Marches On chapter of the War Campaign and at least 7,000 into Revered reputation with the 7th Legion. Chapter 8: Mischief Managed—Requires the completion of The Sleeper Agent chapter of the War Campaign and 14,000 Revered reputation with the 7th Legion. Chapter 9: He Who Walks in the Light—Requires the completion of Mischief Managed chapter of the War Campaign. Want to see just how far along you are? Check out Wowhead’s tracker. And for more details be sure to check out our complete patch 8.1.5 blog collection!